Bleeding gums are caused by inadequate plaque removal. Plaque contains germs which attack the healthy tissue around the teeth. If plaque build-up occurs, gums become inflamed and irritated, which may cause them to bleed when brushing or flossing. This is called gingivitis and is the first stage of gum disease. Gingivitis is usually a painless condition and bleeding gums may be the only symptom. Some other signs may include: swollen, red or tender gums; persistent bad breath or taste; teeth that are loose; and a change in the way your teeth fit when you bite. At this stage, gum disease can be treated and completely reversed. So it is important not to ignore your bleeding gums. Plaque that is not removed will eventually cause the gums to separate and recede from the teeth. Once gum recession occurs, pockets or gaps can form between the teeth and gums. Harmful bacteria and germs can get trapped inside these pockets, attacking the gums and bone supporting the teeth. Plaque will eventually harden into tartar. At this point, gingivitis has progressed into the more serious condition called periodontitis. Periodontitis can cause tooth and bone loss. Other serious problems patients may experience include painful abscesses, drifting of the teeth which may interfere with chewing, and unsightly lengthening of the teeth with exposure of the roots. Periodontitis is also linked to more serious health concerns including an increased risk for diabetes and heart disease as well as an increased chance for complications during pregnancy. What Diseases Can Cause my Gums to Bleed? 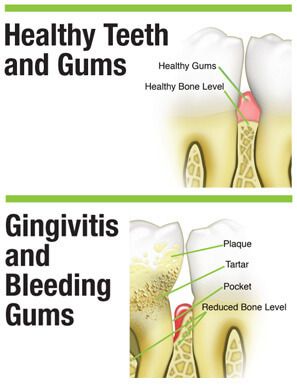 Periodontitis (or gum disease) is one of the leading causes of bleeding gums. Gum disease has been linked to more serious conditions including type 1 and type 2 diabetes, heart disease, stroke and cancer. Even men’s sexual health can be affected by gum disease. Scientists believe that inflammation caused by periodontal disease may be responsible for the association between gum disease and these other conditions. Even more reasons not to ignore your bleeding gums. Other less common causes of bleeding gums include: lack of Vitamin C, lack of Vitamin K, inflamed gums due to pregnancy, thrombocytopenia, hemophilia and scurvy. Stress: Stress is linked to many serious conditions, including periodontal disease. Research demonstrates that stress can make it more difficult for the body to fight off infection, including periodontal diseases. Medications: Some prescription medications can increase your risk of gum disease such as anti-depressants, blood thinners, certain heart medications and oral contraceptives. Check with your doctor or dentist to learn if your medication can affect your gums. Genetics: Some of us are just predisposed to get gum disease. If you think this applies to you, your dentist can perform a simple genetic test to determine your risk. Smoking: Smokers have twice the risk for gum disease as compared to non-smokers. Treatments for gum disease are also less effective for those who regularly use tobacco. How Can I Get my Gums to Stop Bleeding? See your dentist at the first sign of trouble for a comprehensive periodontal evaluation. He or she will prescribe a very aggressive dental care regimen that should get your gums healthy again.